Is Professor Keating still at the top of her game during the fifth season of the How to Get Away with Murder TV show on ABC? We all know that the Nielsen ratings typically play a big role in determining whether a TV show like How to Get Away with Murder is cancelled or renewed for season six. Unfortunately, most people aren’t part of that system. 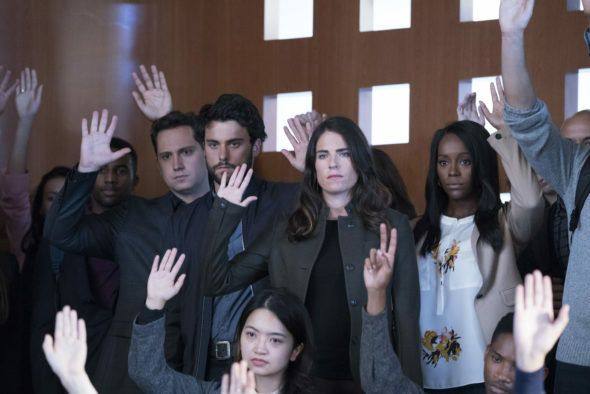 Because many viewers feel frustrated that their viewing habits and opinions aren’t being counted, we’re offering you a chance to rate the How to Get Away with Murder season five episodes here. What do you think? Which season five episodes of the How to Get Away with Murder TV series do you rate as wonderful, terrible, or somewhere between? Should ABC cancel or renew this TV series for a sixth season? Don’t forget to vote, and share your thoughts, below. More about: How to Get Away with Murder, How to Get Away with Murder: canceled or renewed? This is our favorite show and the only prime time we watch. Pls do not cancel. Love this show. I had seen the commercials for this show and heard of the name but never watched until one day I’m like I’m gonna check it out and ever since I have been hooked we need a season 6 and so on! I need to know what happens with laurel and her baby Christopher and so on!!! I can not wait to find out, I do not want To be felt hanging. I even got my mother addicted to the show!!! We need a 6th season and more!!!!!! Annalise Keating for the win!!!!!! Please don’t cancel this show I love it, and would hate for it to end the way it did. We have to find out what happens. Find out where Laurel and Christopher were taken, and if their even still alive. There is so much more that can be done. Loved this show. Can’t wait for the next season. Im 54 and its the best who dun it drama in a very long time. Fans cant be left hanging forever with that season 5 finale! Torture!! Plus itd be nice to see younger cast members graduate . This is one of the best shows I have ever watched. Viola Davis is great as are all the students and other players involved. It would be a tragedy to take this show off the air. I have been watching it for five years and am always anticipating the next episode. I absolutly love Amirah Vann in this season. Her new charakter is made me a regular viewer on HTGAWM ! I hope Teagon Price and Annalies K. become a smoking hot thing! Cause I like the chemistry!